2012 was one of the wettest summers on record in the UK costing insurers approximately £500 million. On 28th June 2012 in particular, torrential flooding brought devastation to thousands across the North East of England. Roads and railways were brought to a standstill, shops and schools were gutted, homes were evacuated and many, many businesses were destroyed. One such local business, The Lakeside Inn in Gateshead, was flooded and was forced to close it’s doors. An enterprise based pub and restaurant, the Lakeside Inn is a well known and much loved establishment, just off the A194 in Wardley. The owners were devastated but undefeated. Following a complete renovation, the Lakeside Inn reopened for business just 5 months later on November 21st with a stylish, new interior. Working with Fernhill Stone, they opted for a modern stone cladding finish to the walls, to combine a warm, welcoming feeling with sleek interior design. They have never looked back and now business is better than ever. Manager Joss Carmichael said “We couldn’t have asked for a better, we are delighted with the result. At the time, things looked bleak but we were determined to get the business back on it’s feet for the sake of people’s jobs. The quick turnaround was a testament to working with some great designers and suppliers.” On why they chose stone cladding, Josh said “We decided stone was ideal for a country inn. We made contact with Meredith from Fernhill because they have such a massive range of stone types, colours and finishes. The stone cladding was much quicker and easier to install and being a non-structural fixture, suited our renovation job perfectly. 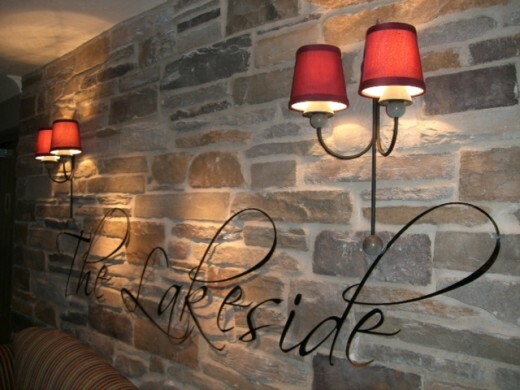 Fernhill Stone were delighted to work with the Lakeside Inn!